I just cleaned out my pantry. It was a toss up between catching a nap with Surya or cleaning the pantry. But this article from The Kitchn.com inspired me. Or scared me. So, no napping. Cleaning. As for the items that survived, I resolved to start working my way through them one at a time. First up, some beautiful dried black eyed peas. Smooth tan exteriors with symmetrical black moons. Nutty, soft white insides. Low in fat and sodium, no cholesterol, high in potassium, iron and fiber and protein. And a creamy addition to Indian food to boot. How could I let these go to waste? I wanted something quicker and lighter than this creamy Black Eyed Peas and Potato curry. 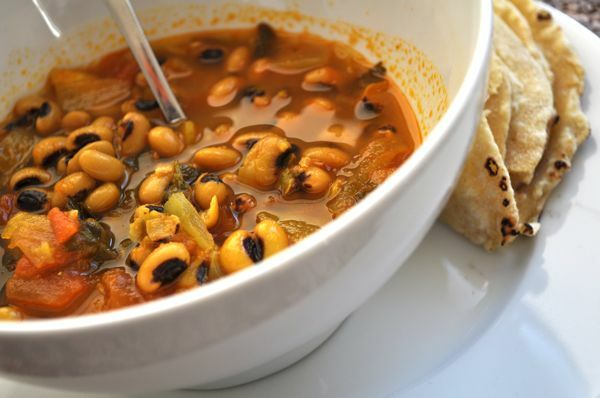 A few hundred Hoppin’ John recipes later, I came across this post from Smitten Kitchen and a link to this Black Eyed Peas in Spicy Goan Curry in the San Francisco Chronicle. Spicy enough to satisfy my Indian hankering but light and fresh enough to not overwhelm on a hot day like the ones we’ve been having in New York. I left out the coconut milk from Ruta’s recipe because I wanted a lighter, tomato-y broth. We didn’t miss the coconut milk, but if you want to add it in, Ruta’s recipe calls for it after 6 below followed by an additional 8-10 minutes of uncovered simmering. The recipe calls for a touch of sugar, but you can’t taste any sweetness in the end. I imagine it just enhances the light, naturally sweet and tangy tomato broth. 1. If using dried black eyed peas, rinse and soak them overnight in enough water to cover. 2. In a stock pot or deep saucepan, heat cooking oil over medium heat. Add the onions and cook for about 8-10 minutes until the onions brown. 3. Add the coriander powder, garlic, ginger, turmeric, cayenne and cumin powder and cook for 2-3 minutes. 4. Add the tomatoes and cook until they melt. 5. Mix in the peas. Add the water, sugar, salt and cilantro and bring to a boil. 6. After you’ve brought the curry to a boil, cover and reduce the heat to low. Simmer for 30-40 minutes until the peas are tender (not falling apart). Ruta recommends simmering dried peas for 20 minutes (I found it required more time) and canned peas for 10 minutes). 7. Add the lemon juice and simmer for another minute or so. Serve with roti or basmati rice. Suji (semolina) – I normally use this for upama but other use would be great! *My rat pack approach to pantry stocking is not to blame for the many varieties of moong beans. I think my mom bought all of them while I was in a post-partum fog. looks great – will definitely try it out soon! btw, your pantry inventory sounds very similar to mine (many varieties of daal and all! ), so i am looking forward to new ways to use those ingredients as well! Moong Daal (Unskinned, spilt/whole) – Pesarattu (moong daal dosa): 1 tbsp rice+1 tsp chana daal for 1 cup of moong daal, soak overnight for dosa batter; usual sides: ginger chutney+upma. Suji – Rava Dosa – 1c suji + 1c rice flour + 1/2c maida + cumin seeds + hing + salt + pepper; instant batter, it’s made to the consistency of butter milk, just pour the batter on your skillet and don’t even have to be worry about spreading it evenly, the batter takes a little longer than usual dosa to turn brown, so no worries about burning the dosa; i love making it. check out vahchef’s youtube video for details. Enjoy! And oh, the whole moong dal – pesarattu that Vichika has mentioned is a good idea, as is using it for sprouts. Suji – you could use it for kesari/halwa. I have lots of dried black-eyed peas lying in the refrigerator too. Have to use that up. Your recipe looks and sounds good! For Masoor dal/Red lentils, I suggest you make ‘Khadi Dal’ using it, the recipe is on my blog. Thanks for the suggestions everyone! I’m excited to try all of these new dishes AND get rid of my pantry items at the same time. Yayyyyy! @Vichika – my parents and I love the vahchef’s videos! Thanks. @apu – I’m not so great about pre-soaking either. I usually use the pressure cooker, but to be honest, it scares me a little! I always feel like I need to duck and run when it whistles. Of course, I still use it. And do sometimes duck and run. I actually soaked then boiled another cup of the black eyed peas, drained them and put them in a freezer bag to use later. Going to see how that works out. Not sure if it will change the texture. I always use the frozen black eyed peas. Get them in any supermarkets. Sure beats soaking and boiling them for a long time. They cook fast. YUM! I just made this tonight. Thank you so much for the recipe; it was delicious. I just soaked my beans while I was at work and they were ready to go when I got home; they didn’t take any time to cook – maybe 20 minutes and I think they were a little over done. @Georgia, glad that you liked it! Thanks for letting me know it turned out well. It really did! You may want to edit in the onions – you left them out of the ingredients – but that’s easy to remedy by visiting Ruta’s recipe. Now if I can just get my desi friend to try these peas…he says he doesn’t like black eyed pea curry – hopefully your recipe can change his mind! Thanks again. This was delicious! I usually cook black eyed peas with lots of tomatoes/onions/garlic/cumin/lemon and I was getting kind of bored with that–this was a little different because of the ginger/turmeric/coriander and being lighter on the tomatoes. out new stuff in your site.